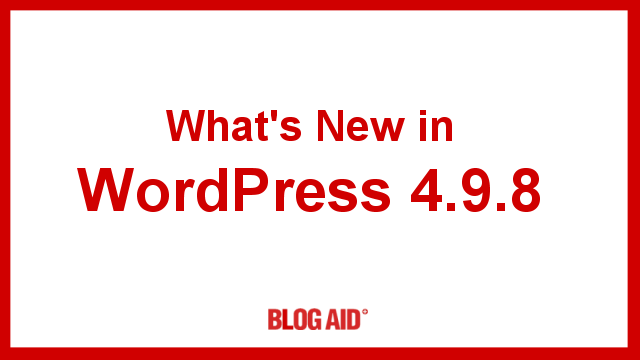 A new Try Gutenberg callout, plus many updates to the new Privacy code, and 46 bug fixes are included in the latest WordPress 4.9.8 release. See what affects you, and options for preparing for Gutenberg. The first new item you’ll notice in WordPress 4.9.8 is an invitation to install either the Gutenberg plugin or the Classic Editor plugin. My advice is to not do either at this time. Instead, simply click the Dismiss link in the upper right. Gutenberg will roll into the WP core very soon, making the plugin useless. There are better plugins than the Classic Editor if you plan to ignore Gutenberg until it matures more. I’ll have a post soon on the better ways to put Gutenberg on ignore for established sites. WordPress 4.9.6 gave us a new Privacy page to use for GDPR. It also included a new privacy-related checkbox on comments. In all, 4.9.6 included 18 Privacy-related additions. Version 4.9.8 fixes a bunch of bugs with those additions, and includes a few enhancements, most all of which are in the code, and not something you will see on the front side of the site. I have not heard widespread issues or bugs with 4.9.8. So, I’m calling it safe to update. If you have taken my advice and exercised full control over your updates with the Easy Updates Manager plugin (see tutorial here) then you will need to manually do this update. If not, then it was an automatic update for you. What problems will I have since I did install the Classic Editor? It’s just a plugin, Debra. You can remove it at any time. I’ll have a post with more info on all options for putting Gute on ignore soon. Thanks, I did the delete, too, and feel better. Whew! I think I’m caught up on my MaAnna posts now : ) My life has gotten to busy this summer, but boy is it nice to know you’ve got my back-I thank you for it!